CLASSIC COMEDY. Adapted from the play by J.M. Barrie. The wealthy Harry Sims is to be knighted in a few days and is flooded with congratulatory letters. He hires a typist to reply to the letters but is horrified when the person who shows up turns out to be his ex-wife, Kate. 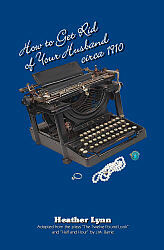 A showdown between the independent Kate and the arrogant, egotistical Harry ensues, and when the dust settles, Harry’s second wife appears keenly interested in Kate’s typewriter. Included in the collection, How to Get Rid of Your Husband Circa 1910.